"A powerful weapon that is difficult to deflect. Capable of inflicting mighty critical blows." Chest in the Lobby after completing the Phil Cup, Pegasus Cup, and Hercules Cup. "Obtained in Olympus Coliseum. Powerful with a quick recovery after card breaks." 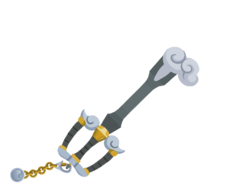 "A combo-mod Keyblade capable of powerful blows. Its powers let you smash through enemy defenses." Slay 50 enemies with the Olympia. Slay 100 enemies with the Olympia. Slay 150 enemies with the Olympia. Slay 200 enemies with the Olympia. 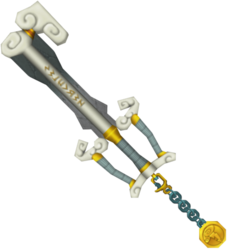 The Olympia is a Keychain for Sora's and Player's Keyblade that appears in Kingdom Hearts, Kingdom Hearts Chain of Memories, Kingdom Hearts Re:coded, and Kingdom Hearts χ. In Kingdom Hearts, the Olympia is in a chest at the Lobby, but the chest will not open until Sora completes the Phil Cup, Pegasus Cup, and Hercules Cup. In Kingdom Hearts Chain of Memories, the Olympia is the signature Attack Card for Olympus Coliseum. 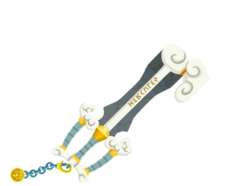 In Kingdom Hearts 358/2 Days, during Roxas's dreams of when Sora defeated the World of Chaos at Kingdom Hearts, the Keyblade is in its Olympia form. In Kingdom Hearts Re:coded, the Olympia is received after Data-Sora defeats Hades in Olympus Coliseum. The Olympia's design differs depending on its upgrades, most of which are only present in the Kingdom Hearts χ games. The default Olympia has a darker color scheme. The top of the guard merely resembles dark grey wisps of clouds. The blade is smaller and thinner, and it lacks the white center and "Hercules." The teeth are similarly dark grey and smaller. The Keychain is a dull bronze, and the token is a grey version of the Olympus Stone with a simple cloud etched onto it. The first upgrade features a lighter color scheme. The top of the guard has longer clouds. The blade is wider and has wisps of the clouds incorporated, while the teeth are longer. The Keychain is a stone color, while the Stone has a longer cloud. 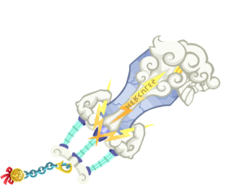 The second upgrade, which is also the only form present outside of the Kingdom Hearts χ games, has grey columns for the handle and sides of its guard. The base of the guard is white, and the top of the guard resembles two white arms flexing their muscles. 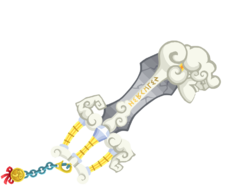 The shaft of the Keyblade is white with grey edges and "Hercules" engraved into the white section. The teeth are set very high on the Keyblade, and are attached to the tip. They resemble clouds. The Olympia as a whole is meant to resemble Greek architecture, and appears to be carved from marble. The Keychain is made of several silver links, save for the first one, which is gold, and the token is the standard Olympus Stone. The third upgrade has a golden handle and guard. The tip of the guard is silver, while the sides feature one muscle upwards and another downwards. The blade has more clouds etched into the design and is wider, and the teeth are bigger and longer. The Olympus Stone has a ribbon. The fourth upgrade has a cyan handle and guard. The muscles are bigger and wider and there are now two crisscrossing lightning bolts from the middle of the handle and into the blade. The blade is wider and silver, while "Hercules" is now engraved into a lightning bolt. The teeth form an image of Zeus, and the Olympus Stone has a brighter color scheme. 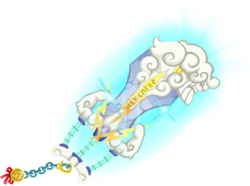 The fifth upgrade gives the Keyblade a powerful, swirling blue aura. The Olympia's English name references an ancient Greek city of the same name, which was where the first Olympic Games were held. The Japanese name, "Power of Hero", references Hercules's godly strength and the worthiness of Sora as a hero. The names of the Olympia's leveled-up forms in Kingdom Hearts Re:coded are based on the letters from the Greek alphabet; Alpha (α), Beta (β), Gamma (γ), and Sigma (Σ). This page was last edited on 5 April 2019, at 15:23.